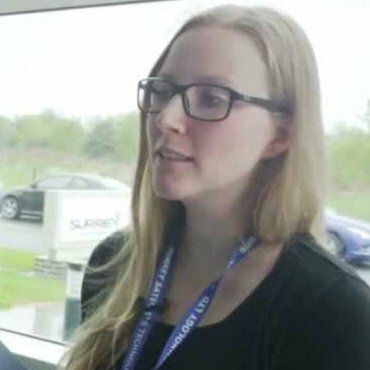 Stefanie Kohl is a space engineer at Surrey Satellite Systems Technology in Guildford. There are different kinds of space engineers, but all of them are in some way responsible for making sure the machinery and technology on their mission actually works. Stefanie is a systems engineer, which means that she works on a spacecraft from the moment the first plans are made, through to its launch into space, and then right to the end of its life, when it is taken out of service. She organises all the engineers working on separate parts of the mission, and makes sure that they’re all working together – so she doesn’t just have to know about all the tech, she also has to be a great team leader. Her job can be demanding, but it’s also incredibly satisfying when you see a spacecraft you’ve worked on actually take off. As a systems engineer working with satellites I have to understand everything that is required to build a spacecraft, and to guide the other specialist engineers doing individual jobs. I am responsible for the technical solution and have to make sure everything is working together, so I always have to keep the big picture in mind, and solve problems when they come up. I’m involved in pretty much everything from the very beginning of a mission, which is amazing. Right now I’m lead systems engineer on a satellite mission that has been four and a half years in preparation. It’s a constellation of three satellites that fly in a constellation, taking really detailed, high resolution photographs of the Earth. It was launched in July 2015, and now we have to make sure it’s working properly before handing it over to our customers who will use the photographs for commercial purposes. So what do you actually do on a typical day? There are no typical days; it’s always different! At the moment we are in the so called commissioning phase, that means we are monitoring the satellites in space and setting them up ready for hand over to the customer. In the morning the satellites pass over Guildford, and that’s when we make adjustments and sort out problems. This is always exciting as a morning pass last on average between 5 to 10 minutes and requires quick responses. In the afternoons I mainly catch up with the team, plan activities for the next day and do software testing on our test bed. Is it like being a regular engineer on earthbound projects? Not really. The big difference between an engineer designing products that go into space and an engineer designing products that stay on Earth is that you have to design a system that you have to take into account the harsh conditions in space. First you have to get it into space, which means loading the satellite onto a big rocket which accelerates at a great rate so you have to design the satellite to withstand that force. Then space itself is a harsh environment - its very hot or very cold, and there’s a vacuum and radiation. And you have to make all the parts so they will work every day for several years – you can’t send anyone up there to fix it after it has launched so you have to make sure everything works once the satellite is in space. I’ll sound really geeky explaining this! I became interested in astronomy because as girl growing up in Germany, I watched a lot of Star Trek. I was fascinated by space and stars and life in space. But when I was a teenager, I didn’t know that jobs like the one I do now even existed, so I didn’t think of working in the space industry. I did maths, physics and astronomy at school, and then studied mechanical engineering at university. I thought mechanical engineering would just be a safe option. But I studied a specialist course in aerospace engineering and it really interested me, especially when it came to the space subjects. But even then I thought it was all like science fiction; I never thought it could be a real job. I went to Holland for a year as part of an exchange with my course, and went to the European Space Agency site there. Also, the Dutch university I was at had a big space department. All that made realise there is a space industry and a big demand for space engineers. After uni I applied for a 12-month traineeship at the European Space Agency. Then I worked there for 15 months before landing my current job. What sort of skills does someone need to be a space engineer? A few different ones: communication skills, open-mindedness, patience, interpersonal skills, being nice! The technical side you can learn on the job – the most important thing is to have common sense. Such a variety of things. I like that every day is different, and I enjoy finding solutions to problems. Working with lots of different people, and constantly adapting yourself to different ways of thinking is challenging, but it’s also very positive and rewarding. And obviously the fact that the things I work on are ultimately going into space one day! I think it’s really important to educate young people and show them the options. There are so many things you can become, and they are not always communicated. Remember that the industry needs all sorts of engineers, and all kinds of people. Do what you’re best at and what you like the most. Don’t try to learn something just to get you into the industry; learn something you enjoy and then come to the industry.